Ferdinand added a dc/dc converter circuit to the transistor tester, allowing it to be powered from 2 AA batteries instead of a single 9volt. 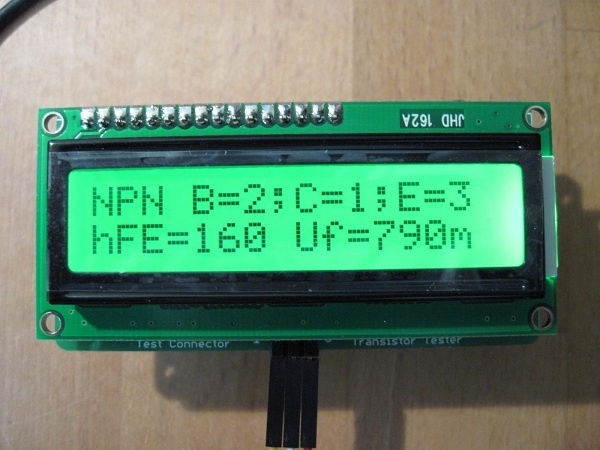 This project is similar to our Part Ninja, it’s designed to test various electronic components like transistors, diodes, resistors, etc, and display their pin out and basic specifications. I built my own version of this handy tool last weekend. I replaced the linear regulator with a small boost-converter. Now the circuit can be powered with two AA batteries. The PCB is sandwiched between the battery holder and LCD, so to provide a handy device without need for a case. I had a lot of fun designing and building the circuit, so thank you DP for highlighting this project. Be sure to check out our video describing the Part Ninja project. This entry was posted on Thursday, May 3rd, 2012 at 1:00 am	and is filed under Part Ninja, project logs. You can follow any responses to this entry through the RSS 2.0 feed. You can skip to the end and leave a response. Pinging is currently not allowed.